1 of 5 Trim spears, discarding tough ends. Peel ends of stalks if asparagus are very thick. Fill medium-size saucepan with 1 inch of water fitted with a steamer basket and place over high heat. When water boils, add asparagus and cover. Steam for 2 minutes or until crisp-tender. Drain and run under cool water; set aside. Can be made up to a day ahead; cover and refrigerate until ready to use. 2 of 5 Heat a small nonstick skillet over medium high. Add bacon and cook 2 to 3 minutes or until crispy. Remove bacon from skillet and drain on a paper towel-lined plate. Reserve bacon fat from skillet and set aside. 3 of 5 Add shrimp to skillet. Cook for 1 to 2 minutes per side, or until uniformly pink; remove and set aside. 4 of 5 In a small bowl, whisk reserved bacon fat (about 2-1/4 teaspoons), olive oil, vinegar, dried thyme, mustard, 1 tablespoon of the minced shallot, salt and pepper. 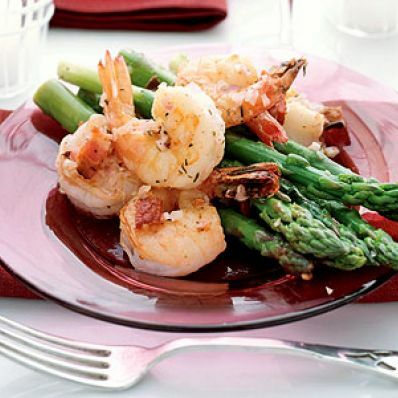 5 of 5 In a medium-size bowl, combine asparagus, bacon, shrimp and remaining shallot. Drizzle with dressing and toss to combine. Serve immediately. Per Serving: 3 g sat. fat, 4 g fiber, 366 mg sodium, 187 kcal cal., 17 g pro., 8 g carb., 10 g Fat, total, 119 mg chol.